UC San Diego scientists said Friday that they’ve identified a molecule that halves the size of an aggressive brain tumor called glioblastoma in laboratory mice. Patients with glioblastoma usually survive fewer than 15 months following diagnosis, and no treatment has so far proven effective, according to UCSD. The molecule — SKOG102 — wedges itself in a temporary interface between two proteins whose binding is essential for the tumor’s survival and growth. The study is the first to demonstrate successful inhibition of this type of protein, known as a transcription factor. “Most drugs target stable pockets within proteins, so when we started out, people thought it would be impossible to inhibit the transient interface between two transcription factors,” said Igor Tsigelny, a research scientist at UCSD Moores Cancer Center. “But we addressed this challenge and created a new strategy for drug design — one that we expect many other researchers will immediately begin implementing in the development of drugs that target similar proteins, for the treatment of a variety of diseases,” said Tsigelny, who also conducts research with the San Diego Supercomputer Center and UCSD Department of Neurosciences. Transcription factors control which genes are turned on or off at a given time. For most people, they operate continuously in a highly orchestrated system. In glioblastoma, one misfiring transcription factor called OLIG2 keeps cell growth and survival genes on when they shouldn’t be, leading to quick- growing tumors. 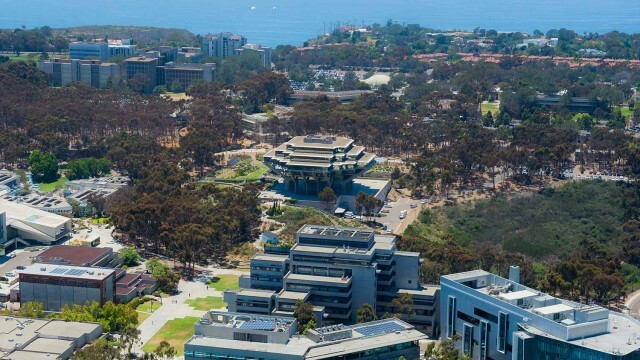 Valentina Kouznetsova, an associate project scientist at UCSD, searched databases of 3B molecular structures and found several candidates, of which SKOG102 worked the best, the researchers said. The scientists said a few more years of study are needed to make sure medication based on the molecule would work and not be poisonous to patients. Researchers with The Scripps Research Institute, Harvard Medical School and Brigham and Women’s Hospital in Massachusetts contributed to the study, which was funded, in part, by the National Institutes of Health, Voices Against Brain Cancer Foundation, Christopher and Bronwen Gleeson Family Trust and American Brain Tumor Association Drug Discovery Grant.